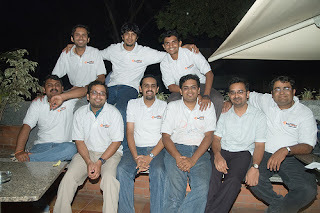 I know its late, but as promised earlier and as one of “proud” participants and also fortunate of being with minds behind the camp, wanted to share my experiences with Making of BarCamp.The first Planning meeting for BCB4 happened on the 3 June 2007 at Cafe Coffee Day on Richmond Road. From then on, every week all of us meet every Sunday at 10 AM at some CCD or the other (mostly at the Koramangala CCD) taking our planning session step-by-step. The day we began Jace came up with the idea of grouping tracks, which we called “Collectives“. There were loads of debates every week and concluding was pretty difficult. Each one of us had our own thoughts. Synchronizing and framing one concept is really a tough task. Imagine, a group of 10 people who have been totally un-known to each other (few of us knew each other from BCB 1), coming together to make an event which will bring in various like-minded people to a common platform to share, learn and understand various “ideologies” is not a simple task. However, we were determined. We wanted to make this happen and the only aspect we were looking at is the Event itself. It was like the situation when Dhronacharya asks Arjuna as to what he could see on the tree for shooting and Arjuna replies “the eye of the bird” (I am very bad at mythology, but just trying to convey as precise as I can). We were looking only at the event and all the discussions we had were like the deviations which pulled us apart. We took them as tests and by the next week we would come together taking the discussion to the next level. Finally, we concluded that this time BarCamp should be different from earlier versions and should be a “Collective Edition”. What we announced during BCB3 was in July. The first weekend was turning a bit difficult with venue and other logistics. The second weekend was Proto.In which we did not want to coincide to ensure that we have our friends from Chennai join us 🙂 So, it was the last weekend which was working for everyone and hence 28/29 July were finalized. The communities which have formed will go forward with take-aways and build their associations. If possible, would come back next time with planned activities and collective projects. On a parallel note, preparations were going on for sponsorships and other logistics. After BCB3, NSRCEL came forward for a long term partnership with BCB and wanted to host this event to ensure that an “educative and motivational” environment is created for creative minds to shape the future of “innovation” and “entrepreneurship”. Now, that is divine blessing. Right? As the dates were getting closer, our To-Do lists were increasing. Fortunately/Unfortunately all of us were having hectic schedules even at work. This happens in life, Right? We asked for volunteers for various tasks, and there were enthusiasts who pitched in. I communicated to volunteers to come to IIM on 27th evening at 5 PM to help us with arrangements. Only two – Hema and Bhavana were the only two who turned up sincerely that evening. They were surprised to see the way things were going. Pradeep, who has his office incubated in IIM was our main venue coordinator. His office was our dumping yard of all the material. We sincerely thank Ashwin, head of MapUnity for baring with us even though we messed up their office. By the time we all assembled (after last minute shopping) it was 10 PM. Banners and other material arrived. Saurabh and team from ENI (Students wing of IIM) which supported the event, took care of organizing the sign-boards and sticking them around. We had dinner and worked out the final logistics which needed to be taken care. We dispersed at around 12 AM committing that we would assemble back at 7:00 AM on 28th to tie up banners around (it was raining and windy the previous night and we decided not to put them up). The next day, we came in by 7 AM (I came in a bit late though 🙁 ) and put up the banners and set-up the registration desk. I would not write any thing more from here. You have experienced in person and also, I wrote about it in my earlier post too. I need to run now, will post feedback summary in my next post…sorry about that. Not to forget Sunday was Hari’s wife’s b’day.. and he was at the BarCamp throught the day!